Every once in a while we get it right. So far our August fly fishing forecast has looked spot on. Hopper fishing has been as good as it gets with great fish being caught on big foam dry flies daily. Just walk 10 feet down any grassy bank. Lots of hoppers to be found buzzing around. The weather has turned hot. Downright sizzling the last few. Good to get out early and wrap it up by mid-afternoon. Temperatures looking to cool back off in the coming weeks. You’ll be good to go all day then. Pink, tan, yellow, green, you name it--- the trout having been eating hoppers in all shapes, sizes, and colors. They will get wiser. If your hopper gets a few refusals, cut it off and change it up. And don’t be afraid to make it dance. Big brown trout love the twitch. Our calendars are filling up fast for September and October. Get ahold of us today to get your 2018 Montana fall fly fishing trip all lined up. Tough to beat fly fishing on the Yellowstone River right now. Also where you will find most of our Montana fly fishing guides through the end of the month. Hopper fishing has been as good as it gets. Lots of days fishing single hoppers from ramp to ramp. Midges, mayflies, and caddis flies still around in the mornings too. If they aren’t on the hopper right out of the gate, you could do worse than throwing a big parachute. We have fished from Gardiner to east of Livingston, MT in the past week and have had great fishing across all stretches. 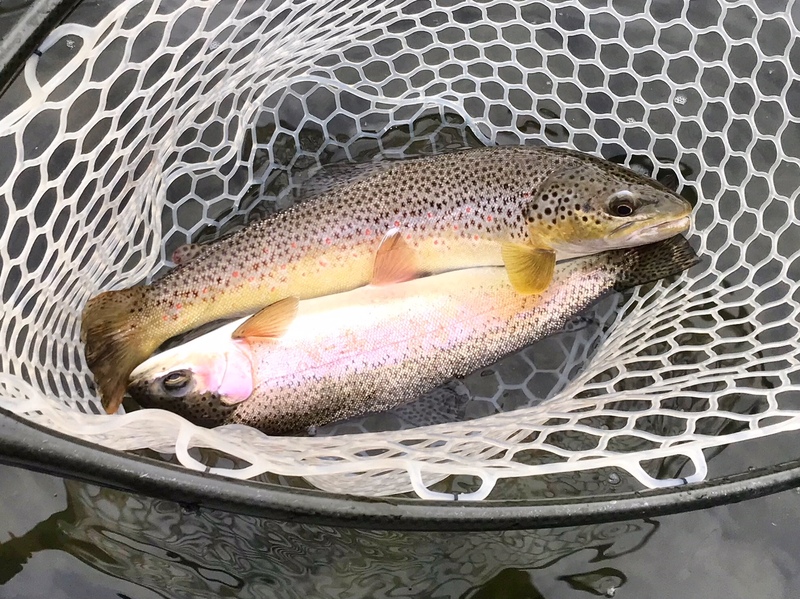 While our primary focus is dry fly fishing, the nymphing has been good with stonefly nymphs, caddis nymphs, and mayfly nymphs while the streamer bite has been tough lately. We blame the big bright sun. Temps are looking to drop in the coming weeks. We like to be on the water early when it’s warm but are usually in no rush once daytime highs are down to the low 80s. Some of the best late summer dry fly fishing we have had in awhile on the Upper Madison. Hoppers, caddis, and ants are what you will find on the end of our Madison River fly fishing guides’ lines. Spruce moths on the upper river. Hoppers down lower. If early mornings are your thing we like the lower lower Madison this time of year. Patience and persistence throwing the hopper will result in finding some nice browns in tight to the banks. Might just hit a home run. Nymphing continues to be steadily good with prince nymphs and variants, girdle bugs, worms, micro-mays, and sculpins being our top producers. But the hopper bite has been good enough to fish it early and late. Tricos in the AM and terrestrials in the PM. Trico dry fly fishing on the Missouri River is some of the most rewarding fishing any angler could experience. Good casts get rewarded, bad casts get laughed at, but lots of shots at great trout are to be had. Probably no better time of year to get shots at 20 inch fish with sz 20 or smaller flies. Sounds like fun to us. The spinner fall stars before 9AM. Get out early to hit it. We like to fish terrestrials all afternoon after the tricos start to wane. Pick a hopper, any hopper, and fish it well, tight to the banks or out in the middle. Head to the upper river if nymphing is more your speed. Lots of big brown trout are being caught on crayfish and various trailer flies. Fish it shallow and tight to the banks or deeper against the grass lines. Lots of cold water still pouring out of Holter Dam. This fall should be great. If wade fishing for wild native cutthroat trout is your idea of a good time, Yellowstone National Park is the place to be right now. The Yellowstone River and its many tributaries are all fishing well right now. Hopper fishing has been great on the Lamar River, Soda Butte Creek, and Slough Creek. Beetles, ants, and small parachutes are always great second options. Classic dry fly fishing for cutthroat trout at its finest right now. If solitude is your thing, consider going for a short hike before starting to fish. The people disappear quickly. In between hatches right now on the Paradise Valley Spring Creeks. PMDs are mostly gone and the sulphurs are yet to start. Daily hatches of midges and tricos have kept things interesting, and some days have made for all day action. The midges are small. Consider throwing a smaller cluster. Or throw an ant or a hopper. Either way works. Terrestrial fishing can be great in some of the faster riffles. Nymphing has been as good as always with midges and sowbugs being our flies of choice. And 7x tippet.